In the summer of 1995, two years after being designated a United Nations Safe Area, the Bosnian town of Srebrenica became the scene of the worst massacre in the Bosnian war. This is an account of the critical days leading up to the killings. 6 - 10 July 1995: The Bosnian Serb Army attacks Srebrenica - within a UN safe area previously held by the Army of the Republic of Bosnia and Herzegovina. Civilians taking refuge there are under the protection of Dutch forces. 11 July: Thousands of refugees and Srebrenica residents - mostly women, children and the infirm - flee to the Dutch UN peacekeeping base in Potocari. Bosnian Serb commanders demand Muslims hand over their weapons. 12 July: Bosnian Muslim men of military age begin to move north after gathering in Susnjari. They are shelled as they flee through the mountains. Some are also gunned down en route, while others are killed after surrendering. 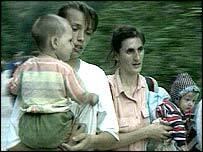 12 July: Male and female refugees are separated by the Bosnian Serb Army. Thousands of women, children and the elderly are deported by bus to Muslim territory. The men are held in trucks and warehouses. 13 - 17 July: Up to 8,000 Bosniak men and boys are killed at a number of execution sites around Srebrenica. Reports of the atrocities begin to surface on 16 July. Source: UN, ICTY. 6 - 8 July 1995: Bosnian Serb forces had laid siege to the Srebrenica enclave, where tens of thousands of civilians had taken refuge from earlier Serb offensives in north-eastern Bosnia. They were under the protection of about 600 lightly armed Dutch infantry forces. Fuel was running out and no fresh food had been brought into the enclave since May. Serb forces began shelling Srebrenica. Bosnian Muslim fighters in the town asked for the return of weapons they had surrendered to the peacekeepers but their request was refused. The Dutch commander called UN Headquarters in Sarajevo asking for "close air support" after shells and rockets landed close to refugee centres and observation posts manned by peacekeepers. 9 July 1995: The Bosnian Serbs stepped up their shelling and thousands of refugees fled to the town from southern camps ahead of advancing Serbs, who attacked Dutch observation posts, taking about 30 soldiers hostage. One peacekeeper was fatally wounded when Bosnian Muslims fired on retreating Dutch troops. 10 July 1995: Dutch Commander Colonel Karremans filed a request for UN air support after the Bosnian Serbs shelled Dutch positions. UN Commander General Janvier initially refused, but agreed after another request from the colonel. Serb attacks stopped before the planes arrived and strikes were postponed. Some 4,000 refugees were in the town by the evening and there was panic on the streets. Large crowds were gathered around the Dutch positions. The Dutch commander told town leaders that Nato planes would launch massive air attacks against the Serbs if they had not withdrawn from the safe area by 0600 the following morning. 11 July 1995: The Serb forces did not withdraw, but at 0900 Colonel Karremans received word from Sarajevo that his request for close air support had been submitted on the wrong form. At 1030, the re-submitted request reached General Janvier, but Nato planes had to return to base in Italy to refuel after being airborne since 0600. By midday, more than 20,000 refugees - mostly women, children and the infirm - fled to the main Dutch base at Potocari. At 1430, two Dutch F-16 fighters dropped two bombs on Serb positions surrounding Srebrenica. The Serbs responded with a threat to kill their Dutch hostages and shell refugees, causing the suspension of further strikes. 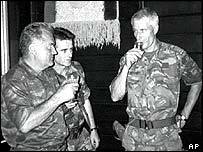 The Bosnian Serb commander Ratko Mladic entered Srebrenica two hours later, accompanied by Serb camera crews. In the evening, General Mladic summoned Colonel Karremans to a meeting at which he delivered an ultimatum that the Muslims must hand over their weapons to guarantee their lives. 12 July 1995: Buses arrived to take women and children to Muslim territory, while the Serbs begin separating out all men from age 12 to 77 for "interrogation for suspected war crimes". It is estimated that 23,000 women and children were deported in the next 30 hours. Hundreds of men were held in trucks and warehouses. About 15,000 Bosnian Muslim fighters had attempted to escape from Srebrenica overnight and were shelled as they fled through the mountains. 13 July 1995: The first killings of unarmed Muslims took place in a warehouse in the nearby village of Kravica. Peacekeepers handed over about 5,000 Muslims who had been sheltering at the Dutch base at Potocari. In return, the Bosnian Serbs released 14 Dutch peacekeepers who had been held at the Nova Kasaba base. 16 July 1995: Early reports of massacres emerged as the first survivors of the long march from Srebrenica began to arrive in Muslim-held territory. Following negotiations between the UN and the Bosnian Serbs, the Dutch were at last permitted to leave Srebrenica, leaving behind weapons, food and medical supplies. In the five days after Bosnian Serb forces overran Srebrenica, more than 7,000 Muslim men are thought to have been killed.